The team at Google Research have released three “appsperiments” to the Google Play Store and App Store. The new mobile experimental mobile photography apps each brings unique photo or video functionality that rely heavily on Google’s algorithm expertise. Each uses experimental stabilization and rendering technologies that have been designed with the capabilities of the next generation of smartphone cameras in mind. 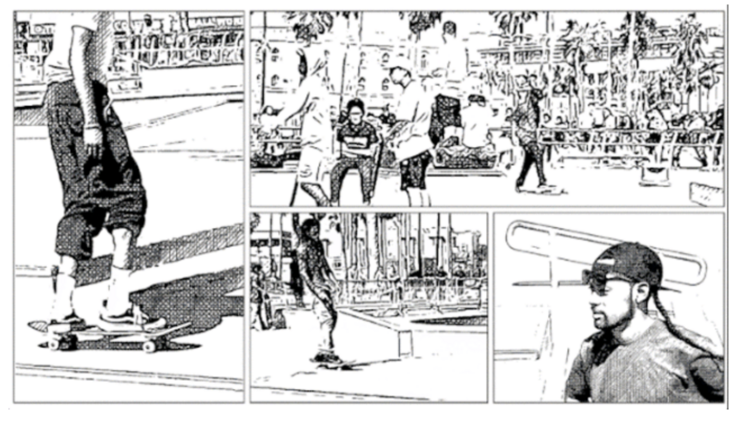 Storyboard (Android) is designed to transform a user’s videos into a single-page comic layout entirely on device. A user shoots the video and loads it into the app, which automatically selects interesting video frames, lays them out, and applies one of six visual styles. Users can save comic or create up another one of up to a remarkable 1.6 trillion different possibilities. Selfissimo (iOS, Android) taps into the selfie craze by taking automated selfie portaits in black and white. Users tap the screen to start a photo shoot while the app encourages a user to strike different poses. It senses when a user stops moving and then takes an automatic snap. Simply tap to stop the session and review the subsequent contact sheet for the results. Scrubbies (iOS) has been designed to allow users to effectively remix a video by “scratching” it like a DJ. Users can manipulate both the speed and direction of the video playback to create video loops. Scrubbing with one finger plays the video while scrubbing with two fingers captures the playback for sharing or saving.